Beer not warmed by hand – People have this problem? How slow are you drinking your beer? Moreover, how hot are your hands, exactly? 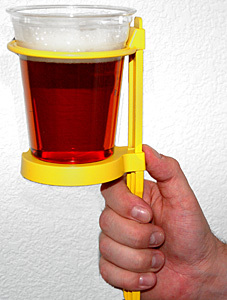 Warm enough to essentially microwave your beer, I guess. Hand will not get cold & wet – How sensitive to cold are your palms? So sensitive you can’t hold onto a chilled drink? And really, any cold beverage is going to get your hand slightly damp. We’ve lived with it our entire lives, it’s a hardship I think we’ve all learned to endure. Unique and fun to use – NOPE. “Awkward and difficult to explain” is far more accurate. Sits easily on a table – I’d love to see how they pull this off. Do they mean you should set it on the edge of the table and leave the holder part hanging down? Did they forget WE HAVE KNEES? Holds 16/20 oz. cups and 1-pint glasses – NEWSFLASH: 16oz is the same as 1 pint. It’s clear by the existence of your product you despise humanity and assume we are all mouth-breathingly unstoppably-droolingly stupid (maybe even stupid enough to buy Beer on a Stick! ), but it’s over the line insulting to assume we don’t know basic measurements. Custom Logos – The quickest way to smear your business’s name! Unlimited colors – Even LIFE has a limited number of colors. Again, don’t assume we’re as retarded as you. Re-usable – No thanks, the once was more than enough. FLAMING, right? They took the biggest, muscleiest guy they could find*, stuck a Beer on a Stick in his hand, and he is magically transformed into the gayest preening prancing ponce you’ve ever seen. If the toughest dude they could find looks queerer than a $3-dollar bill when holding a Beer on a Stick, what will you look like? I implore you, dear reader, DO NOT BUY THIS PRODUCT. 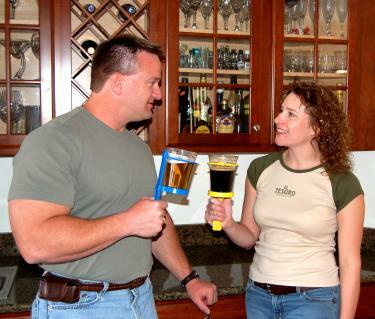 These people are undercover Drys trying to destroy drinking culture from the inside. They must not succeed, and our inebriated (and susceptible to faux-beer drinker influence) brethren must not be duped into purchasing such a moronic item.